No matter what iPhone model you own, it is highly likely that its camera features will still be limited. One of the few limitations of a smartphone camera is its inability to stay steady in low-light environments. Sure, iPhone 6s and later models have advanced camera features such as optical image stabilization for optimal images, but they’re often a hit and miss. For this reason, you, as an iPhone owner, should consider adding gadgets or add-ons to your iPhone camera to increase the quality of their shots. Some of these add-ons are iPhone tripods and mounts. The benefits of mobile tripods and mounts include giving stability to the camera and helping mobile videographers and photographers get the spectacular, steady, crisp shots they desire. An iPhone tripod also lowers the stress your arms would feel from holding the camera for way too long. You could also get blurred images in low-light environments and low shutter speeds if you hold your iPhone camera with your hands. For that reason, a phone tripod is a great accessory for anyone’s mobile photography, especially in low light and in taking self-portraits. On that note, this article is a comprehensive guide you need to read to help you get the most informed decisions on what factors to consider, what features to look for and what key points to take note of before you buy the best iPhone tripod that suits you the most. If you’re interested in scaling up your mobile photography skills, then this guide is for you. The most popular type of tripod heads today would be ball head. This type is ideal if you want to position the tripods in any direction because the rotating ball lets you move it around in all angles imaginable. What makes this type also practical is the fact that it has a locking screw that keeps the tripod ball secure in one position. What you get is a lot of possibilities of positioning your camera that couldn’t be done by other types. Another kind of iPhone tripod is the pan and tilt type. The parts that make this type different from the rest are the two axes in its tilt heads. The axes allow the user to tilt or pan the camera independently to get a better angle. There are also fluid head tripods, which are great for video work. The friction you get from this tripod also gives you a better moving shot when video recording. Another type of tripod is a monopod. The monopods are technically not a tripod, but they still perform the same function as one. Monopods are used for adventure shots and sports photography. People who use this monopod can skip using the long gimbal heads for long lenses because it can do the same job. 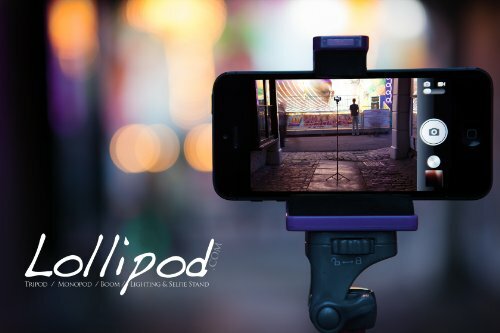 Among these types of tripods, we recommend ball heads for your iPhone because they’re the simplest to use and the most versatile to handle. During night time shots and sunset scenes, the stabilizing feature of tripods makes for a better shot. Also, reduced lighting makes it even more necessary for mobile photographers to rely on a tripod’s stability. Also, when you move around shaky areas or your hand-grip is not that steady, an iPhone tripod can improve your picture quality and lessen blurring. Close-up shots are tricky to do for mobile photographers, especially at night, and the convenience of a tripod is that it lets the less skillful mobile photographers get perfect, steady close-up images with a mobile camera tripod. Lightweight, ultra-compact octopus tripod to carry and almost universal in its use both for mobile phones and compact cameras. 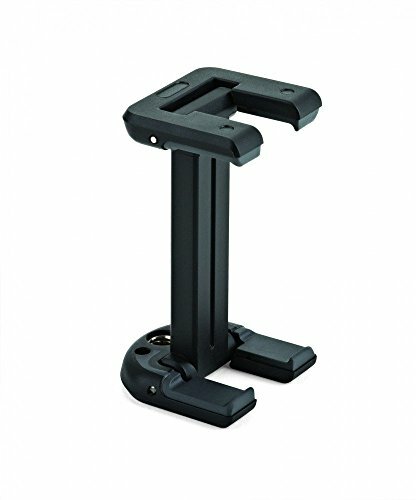 This compact octopus tripod kit (ball head + stand) weighs only 0.43lbs (197g) but has a 2.2lb (1kg) load capacity, with diverse support options for its jointed legs. This model has rubberized joint rings and feet for the grip, which enhance stability. You could also enjoy a 360° panning for this tripod, in addition to its 90° tilt. There’s also a ¼”-20 tripod mount for the entire equipment along with a stainless-steel material with proprietary ABS plastic. What makes this ball head octopus tripod great is that it uses a reliable ¼”-20 screw that’s completely threaded to fit even the mirrorless cameras and video lights that are used in professional set-ups. Its full 360° panning and 90° tilting means you have the freedom of movement, allowing you to capture shots you thought could only be done by professional DSLR cameras. The locking knob at its tip also helps you retain that perfect position you worked hard to prepare. You should use this when you want multiple angles in your shots without getting shaky images. This is also the ideal iPhone tripod for vloggers, movie makers and photographers to use when they want versatility in their shots that don’t require them to carry bulky parts. Lightweight, ultra-compact octopus tripod to carry and almost universal in its use both for mobile phones and compact cameras, amounting to a weight of 2.2lbs (1kg). Compatible with target microphone, compact video camera, and flash add-ons. Issues may arise when this tripod is used for long exposure shots at night time because of shakiness. The octopus legs may get dislodged after continued use. Portable design, instant head lock system, and solid construction. 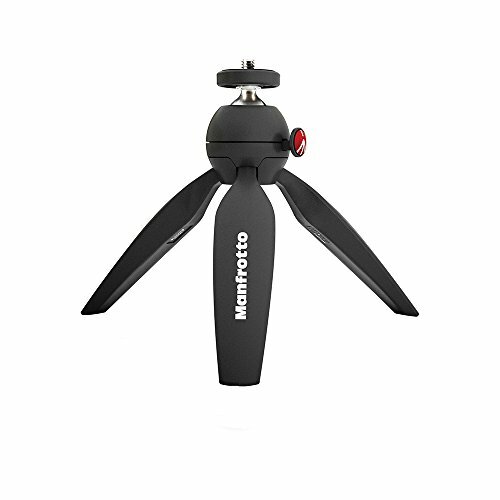 The tripod brand, Manfrotto, has an excellent reputation for creating professional-grade mobile photography gear. The Manfrotto Mini Tripod also sustains its good reputation. This iPhone tripod is perfect both for high-level and low-level angle photography because of its ball head. It also has a smooth ball head that can rotate to about 360 degrees with a quick-release plate. Its central column is hexagon-shaped, which is ideal for a 90-180-degree movement. It also has an instant swivel Stop-n-Lock (ISSL) that securely repositions its central column to one steady movement. 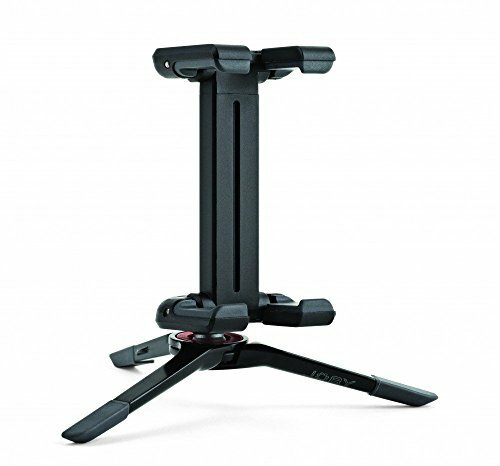 Its premium die-cast canopy that’s made of magnesium makes the tripod robust. You should buy this tripod if you’re a mobile photographer who might also want to use a tripod for a bigger standard DSLR camera. You can also use this tripod when you want to try macro photography using only a mobile phone. This tripod is also useful for long exposure shots that only have low light because it keeps your iPhone at its steadiest. Stable fulcrum that enables a 90° upwards or downwards movement. Independent 360° rotation ability, which gives the tripod an extra feature to use as a media viewer. Tripod’s rubber feet have a twist-out and metal spikes that increase the tripod’s stability even if it’s placed on unsteady surfaces or uneven ground. At 7.28 inches / 18.5cm (closed length) the tripod loses the height advantage of taller tripods. If you use this tripod for an iPhone that has accessories, such as a mic or external flash, the tripod could slip if the accessories are too heavy for its short legs to handle. The plastic and metal material may not be professional grade. This is a compact iPhone tripod with three leg sections that collapse up and down. It also weighs less than 1lb (0.45kg) and has padded leg wraps that are conducive to a more comfortable carriage. Its three-way pan head allows for quick release when mounting an iPhone or standard camera. It also has adjustable legs that can be splayed out to lower the tripod’s height. This tripod can also be used for extremely low-angle shots or macro photography that involves a landscape. With its operating structure that is a crossover between a selfie stick and tripod, you can use this for selfies and long-handle group shots. This tripod also has a lightweight foundation, so you don’t need to worry about carrying heavy gear. This iPhone tripod is perfect for mobile photographers who want a ball head type of tripod that is compact but can still be used for macro photography. You may want to use this iPhone tripod when you have both an iPhone camera for mobile shots and also at the same time do selfies with friends, and you only want to use one tripod. You should also buy this tripod if you want a multipurpose tripod whose spine can be extended up to four feet for both low-angle and panoramic shots. Can become a full-sized tripod and retractable selfie stick so that you can use this for various purposes. Alloy legs in the gunmetal finish make this iPhone tripod also clean to wipe off. Thin and skinny, so can be a problem when taking shots in windy areas. The quick release of this tripod is not the best in its category, and there’s no separate locked and unlocked button. Lightweight and pocket-sized, this iPhone stand is designed for taking photos and playing movies. This could be the most compact iPhone tripod out there today. You can take it with you wherever you go. Its sturdy and foldable legs are more than stable for your iPhone. It’s lightweight and pocket-sized, so it’s the perfect travel tripod. There’s a clamp-style design for its rubber grip pads, and this creates a solid hold that secures your phone in one location. Its internal steel spring also allows you to securely use it for your tablet and other gadgets, saving you luggage space. If you’re anything like me, you will buy this if you don’t need bulky and retractable multipurpose tripods for your travels. You can also use this when you’re out traveling with your friends, and you need a portable travel tripod for your group photos without the need to carry a big-size tripod that you can’t fit in your pocket. Ultra-lightweight (1.6oz / 46g ), compact and portable, fits in your pocket. Compatible with almost all iPhone models and other large smartphones. The mount has a 0.72lb / 325g load capacity. Sturdy because it’s made of ABS plastic, wear-and-tear proof. Bottom clap may break after months of use on bigger sized iPhone models. Doesn’t work well in a vertical/portrait position of your iPhone camera. It's compatible with all iPhone models, and includes accessories for taking selfies and group photos. 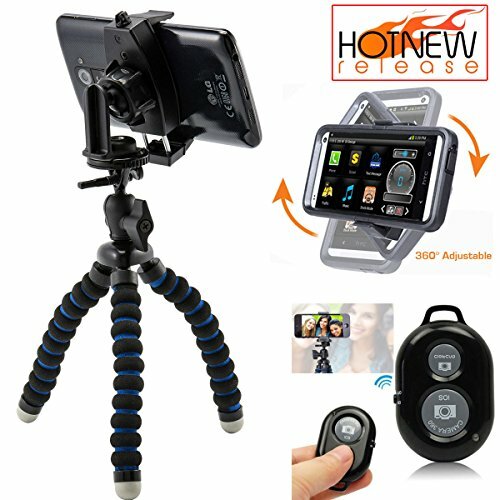 What you will like about this iPhone octopus tripod is the fact that it is multipurpose. You can use it as a selfie stick, iPhone stand and vlogging tripod that also works as an accessory crutch to give it more stability. This iPhone tripod also has a dual-handle head and continuous drag fluid movement for pan and tilt axis in a simple and easy-to-use design, all in a 5.4-ounce weight. You should buy this octopus tripod when you want to give your iPhone camera a professionally approved tripod that’s sturdy and have rubberized heads for extra stability. Mobile photographers who want to put a fluid drag movement in their shots can use this tripod when they want to take 360-degree photos and other panoramic shots without the need for complicated installation. This octopus tripod can hold more weight than your iPhone camera, so if you want to use this for your other cameras, then you don’t have to buy another tripod set. Easy to install, which only includes screwing the tripod joint to the iPhone, and you’re done. Rubber parts of the tripod easily fall off. Plastic latches that hold the phone off easily pop out. The parts that hold the smartphone may be too small to hold bigger iPhone models. This mount is compatible with GorillaPod and other tripods via a universal ¼-20 thread. It can hold any iPhone model including iPhone 8, 8 Plus and X. This tripod mount is super compact, can be carried anywhere and can be used for ¼”-20 thread tripods. When mounted, you can use this to watch videos and stream photo slides hands-free. Lightweight design is also convenient for light travelers. Its hands-free stability is also perfect for that solid hold you need when you’re shooting crisp images. Lightweight, no need to worry about lugging bulky parts. Stable and sturdy because of strong internal steel springs. Useful for kids so they can have something to view while on the plane. Not so good to use when you’re viewing your phone in portrait mode. Limited viewing in vertical arrangement irritates users. May be overpriced considering the limitation in viewing arrangement. Take your photos and videos to the next level by adding a external microphone and LED light. 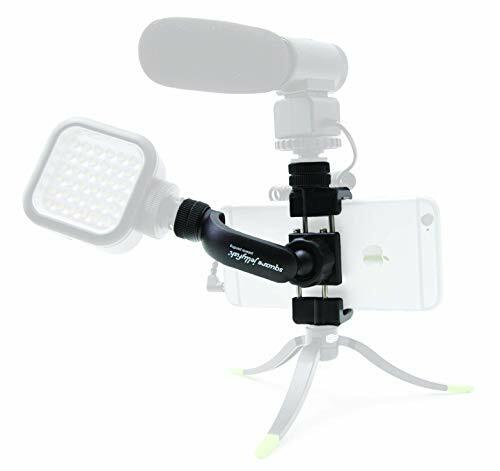 This tripod mount is perfect for holding an iPhone or any smartphone in the market, plus two extra accessories, such as an LED light or microphone. Two accessories are attached to this mount, which fits securely to any standard ¼”-20 camera mount threads. The ball joint is also able to attach a light on and freely position it. That said, the options of the accessories you can pair with this mount are endless. Extremely lightweight, which is just about 0.64oz (18g). Its metal insert at the base is compatible with most ¼”-20 tripod threads. Compatible with most smartphones in the market even with the case on. The base is so tiny that it’s hard to secure it with a tripod. Thin support stick, which makes it vulnerable to breaks. Prone to rotate from portrait to landscape when you don’t want it to. This tripod mount stands out because of its universal compatibility with iPhone and other smartphones. Its flexible joints can be wrapped and secured to the phone and its accessories for easier camera positioning and precise video and photo composition. This mount’s rubber foot also stabilizes the smartphone for better media consumption. Made of durable ABS plastic that has internal metal structure. It fits smartphones that are 2.2 to 3.9″ in size. Has rubber feet that create stability to the smartphone. Too expensive for a mount that doesn’t offer fluid shots. The bracket that holds iPhone can’t easily be tightened. If you want to upgrade your mobile photography game, then it just makes sense to add more gear to your iPhone to increase the quality of your images. If you already have a robust iPhone with you, the tripods you can pick from the list we prepared above will be the next additions to your level-up. We hope that with this article, you were able to find out which iPhone tripod or mount works best for you, suits your lifestyle and gives you the best features. Now go ahead, buy the iPhone tripod and mount that you need and experience the world with literally a different set of lenses. These tripods and grips look really durable for me. thanks for sharing, I am currently looking for a tripod with a grip. 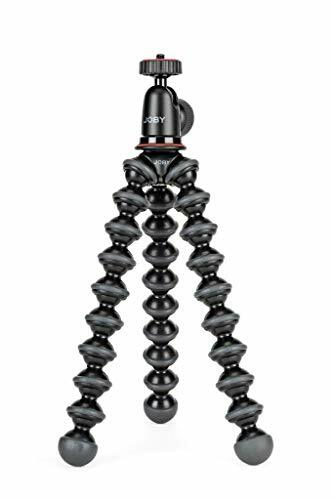 I think i’m torn between the gorillapod and the Chargercity kit. I need one that I can put on my bike’s handle and take off anytime when I need to take a selfie or something. I think, it’s the kind of tripod I am looking for. love your posts!